You are a parent of two or three children but your stroller is not sufficient for keeping them together. Sometimes you have a hard time crossing roads and managing them in shopping malls. Yes, I understand your feelings. Should you buy a second stroller? But that will add more troubles as you will need to manage two strollers at a time. In that situation, a stroller board can be the best solution for you. It will allow your older baby to stay at the back of the stroller where he can sit or stand on it. 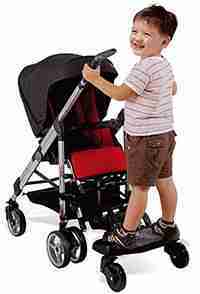 It is perfect for children who are too big for strollers but still too young to walk long distances. In this guide, We have a list of 10 best stroller boards that will make your 2019 better. 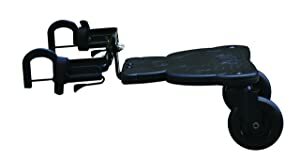 What to look while buying a stroller board? Why spending money to buy a double stroller when you can simply convert your single stroller into a double one? That’s precisely what Lascal BuggyBoard does. The universal connector of Lascal is true to the term “universal”. 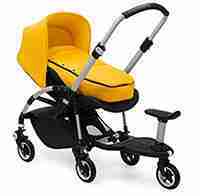 It can fit almost any quality full size stroller and even double strollers. It comes with multiple attachments too to help you securely fit the ride-along board close to the stroller’s arms, making it easier to push. And the best part? You don’t have to be a tech-wizard to install the pieces, making Lascal Buggyboard is arguably the best buggy board 2019. Children from age 2-5 and weight up to 66 lbs can easily stand on the board. It’s made to give your child effortless transportation while you can shop and walk around. Talking about effortless transportation, I should also mention that the wheels are incredibly sturdy. What’s more? It has long suspensions to aid seamless, smooth rides. The platform is wide enough so that your child’s feet have plenty of room and travel with comfort. While features like side bumpers, suspension system, and non-slip platform offer additional safety. Easily fit with 99% strollers in the market. The universal connector provides easy to fit and remove option. Very easy to install without any tools. Wide platform for comfortable standing. High ground clearance makes pushing trouble-free. Has to remove the board every time when you folding the stroller. 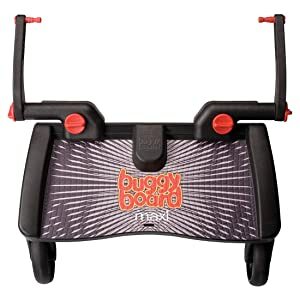 At #2, I have another stroller board which convenient fits all B-Agile strollers as well as BOB single jogging strollers. Thanks to its special quick release system, the board can be attached and removed in a breeze. You will find tons of tutorials to how to assemble it in minutes. It goes without saying that toddlers don’t like to sit around for long, especially when navigating amusement parks or shopping malls. Attaching this stroller board to your stroller is not only fun for your kid but also a savior for you. It doesn’t make your stroller bulky. You can easily turn it into any nook and cranny, on sidewalks, making it perfect suit for Disney Strollers. The wheels are sturdy and don’t make noise, allowing for a quiet and smooth ride. 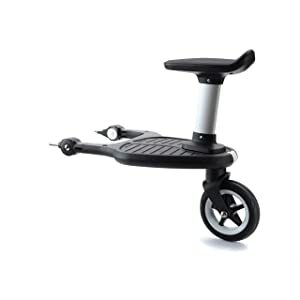 The board comes with three wheels which offer greater balance and support. While the capacity is 50 lbs, but we do not recommend using if you have a child closing on this limit. I also love the easy folding mechanism of this travel system. Not only it saves a lot of space but also lets you fold the stroller single-handedly. You can also adjust the position of this board which gives you the flexibility to keep it close to the stroller or further away. Storage strap to put the board out. 3 wheels for increased stability. Needs no extra tools for installing. Quick-release feature is useful for removing the board keeping the mounting bracket in place. Might find issues with kicking the board (depends on your height). The Baby Jogger is compatible with a number of selected City stroller models including both single and double strollers. These include City Mini, City Mini GT double, City Select etc. Coming to the key feature, your older and younger child can both enjoy stroller rides using this stroller board. Just simply attach it to the rear axle and your older child can step in. The surface is made non-slip for ensuring safety. What I don’t like about this product, you can not run or jog faster with this. Although, some users are quite comfortable jogging with it. The board has ample space for your child to feel comfortable standing. I love the fact that you can easily fold the stroller along with the board and keep it in your car. The board is lightweight, so it’s easy to carry along with the stroller. Great for transport: folds easily along with the stroller. You can adjust the angle up and down to make it level for different stroller frames. The distance from the frame is an easy, single hand adjustment so your baby can stand inside or outside of the handle. Mostly compatible with just City stroller series. If you own any UPPA Vista model made after 2015 and need a ride-along board for your kid who doesn’t want to sit, this could be the right product to invest in. In case you don’t own a Vista stroller, you can always look for other options. Moving on to the review, the surface area is large enough for easy standing and safe enough to not slip. The board material is wood, so it’s eco-friendly. The wheels attached to this board are durable enough to handle bumps and curvy paths. The installation process is effortless and requires no additional tools. You can also fold the board up and transport along with the stroller. That’s great news for outgoing parents. What I love most about this stroller is it’s a higher weight limit of 56 lbs. That means your child can grow with it and still enjoy riding. Folds up and easy to store with the stroller. Wheels adapted for bumpy roads. Some users have found issues with kicking board. Being a mother of a super mischievous toddler, I know how much kids can nag to stand on their strollers. Since carrying them in your arms for hours is not a practical option, what do you do? You get something like Bugaboo which easily attaches to the back of a stroller. Extra brownie points for the addition of a detachable seat. It gives your kid the luxury to either sit in or stand while riding, on demand. For kids as whimsical as mine, Bugaboo stands out as the best buggy board with seats. Period. Many stroller boards don’t give much breathing space, but this product does otherwise. You can even adjust the position of the board as per your convenience. Riveted grooves and non-slip surface provides security, so your child can stay in place. Detaching and attaching is fairly quick but you need to buy an adaptor to do it. You may notice it’s a one wheeler stroller board and that’s what I love about it. It’s easier to carry and handles your child weight pretty well. Baby can enjoy both standing on it and sitting on the seat. Removable seat for your child’s comfort. Offers flexibility to parents as board position can be changed. Easy to carry because it’s lightweight. Need to buy the adapter separately. If you are among the parents who constantly complain about your feet kicking the stroller, the Guzzie+Guss should be the best buggy board to buy. Why? Because the glider of this particular model sits decently high above the ground. That way, it won’t disrupt your normal stride. 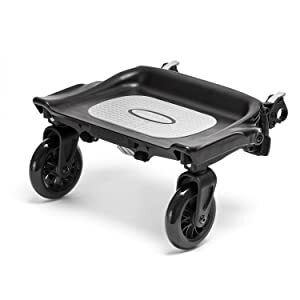 This product comes with a universal connector that fits almost all strollers of various brands. Children under the age of 5 years can easily ride safely with this. What’s more, you can fold the board along with the stroller for convenient storage. Wheels rotate 360 degrees and fairly easy to maneuver on rocky and grassy surfaces. Compatible with 99% of strollers. 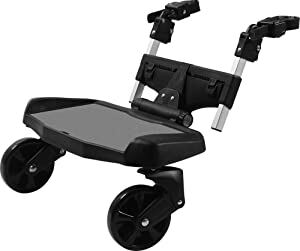 Easy to assemble & connect to the stroller. Weight handling is low, wheels can become unstable with excess weight. 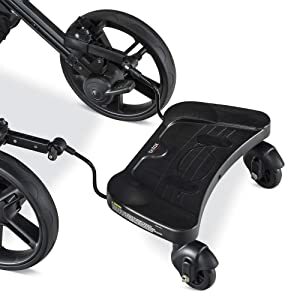 If you are looking for a cheap stroller board that works just as fine as other strollers in this list, the Englacha Easy Rider is what you want. You have to remember that this stroller board comes without a universal adapter. But that’s won’t pose a huge problem. It has a special adapter which you can attach to the rear axle tube of your stroller. Additionally, the adapters come in 3 sizes, so it goes without saying that it will fit most of the strollers in the market. Another feature I absolutely adore is how easily you can adjust the height and width of the board to your child’s comfort, thanks to the quick on/off connector. For further safety and easy storage, it boasts of a storage strap and coupling straps. The weight limit is 45 lbs and your 15 months and above child can have a great ride. It’s compatible with 80-90% stroller brands. You can buy a separate extension handle to increase breathing space. But we don’t recommend that because your child might come in its way. Quick and easy on/off mechanism. Attaching and detaching is very easy. Rides smoothly on most terrains. You face difficulty to put it together. This is an updated version of the previous model. While the previous one lacked a detachable seat, the makers have resolved that minor issue in this model. That’s not it. The seat provided with the board comes with few extra features. There is a seat belt for your child’s safety and moreover, he can hold the bar in front of it for better grip. All these together with the non-slip surface are a good buy for the money. You can adjust the height of the stroller board, so kicking can be avoided. Many good stroller boards just lack this simple feature. The wheels are durable and remain stable on small to medium bumpy roads. Walking slowly is preferable but you can also walk at a brisk pace without kicking the board. The seat comes with security features like seat belt and gripping handle. Comes with Storage strap for keeping the board in place when not in use. The board seat is removable. If your baby wants to stand then you have to carry the seat. Giving your children a hell lot of fun must have been the modus operandi of the manufacturer while crafting this model. The Freerider buggy board is packed dual functionality and lots of fun. 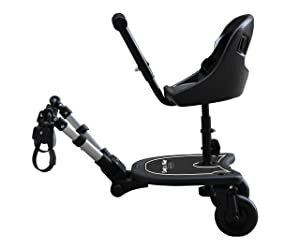 Your child can use it as a scooter and also as a buggy board attached to the stroller. Getting the feel of riding a scooter with the stroller can be exciting for your kids. The wheels also light up when they roll. What’s not to love, man? 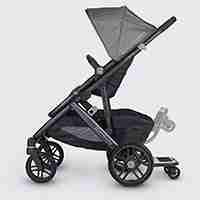 There’s a removable handle that can give added support when strolling. What’s more? There is break bad in the rear wheel and makes it good enough to use as a full functioning scooter. Another major highlight of this product is its compatibility with multiple stroller brands such as Mountain Buggy, Baby Jogger, Bugaboo and so on. 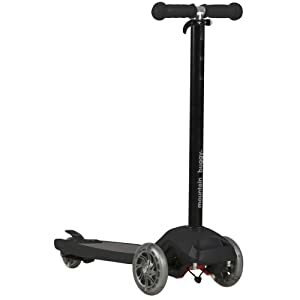 Works both as a scooter and a stroller board. Adjustable handle for various height of children. Have 3 types of connector, so need to confirm before buying. Some Users complained about the unstable nature of the wheels. The Peg Perego is a sleek and stylish stroller board that can make your traveling easier. It is compatible with certain single and double strollers or double umbrella strollers of the Book line. Going by the overall design, I have to admit that it is one of the safest buggy boards in the market for older kids. The best part of this product is the attachable handlebars that come with it. So, if you feel your feet are touching the board, just install the handlebars. The book board is foldable which means you don’t have to remove it manually every time you get on the car or store it away at home. Plus, it’s not too bulky so you don’t have to worry about fatiguing your arms either. Carrello Book S & many other models. Fits most of the Book series strollers. Extendable handlebars provide space to avoid kicking. Folded and unfolded at ease along with the board. Long term use may cause technical issues. Stroller boards are designed to offer extra functionality to parents who travel a lot, spend more time shopping and who wants comfort for their children. Provides individual space for carriage: Single stroller or double stroller, you can own an additional space for your child. So, if you are a parent of 3 children, then the stroller board is made for you. The best part is all your children get to stay and ride together, making their journey enjoyable. Convenience: You might be a single parent or just want to ride a single with all the kids. So, carrying a second single stroller or a double stroller can be painful, even impossible. Why worry? Just add a stroller board and let your oldest kid stand and ride. Cost effective: For parents living on a tight budget it would be punishing to buy another stroller. Instead of spending thousands on a new stroller, you can choose the cheaper alternative- stroller board. Provides safety and comfort: You don’t want your older child to walk alone when crossing the street. It’s better to avoid danger and keep all of them together in such situations. A stroller board should be perfect for this. When you are in shopping malls, walking all day long, your older child can take rest on it. Just get a stroller board with seat for more comfort. You should look for stroller boards that have universal adapters. That will ensure fitting with all strollers. If it’s non-universal, read manufacturer’s information and stroller board reviews to know the compatibility factors. You should review the design specification first to know whether your child can stand with ease or not. If it comes with a seat, make sure the seat is comfortable and secured. The board must be of high quality with durable wheels. Unstable wheels can break and cause accidents. Check first whether the adapter is firm and properly connected to your stroller. You should look for easy to install stroller boards. Many boards come with unclear instructions and can give you nightmares with a complicated installation process. Avoid them! Foldable stroller boards can be a lifesaver when you travel with your car. Because you can fold the board along with the stroller and keep it in the car. Saves a lot of time from attaching and detaching. Almost all boards should come with an anti-slip surface. If your preferred board doesn’t come with it, just avoid them blindly disregarding the features it has. Depending on the weight of your child you should buy a stroller board. If you get one that cannot handle your child’s weight, it will become hard for you to carry and dangerous for your kids to ride on it. Considering walking space, weight capacity, universal connector and ease of installation, The Lascal Buggy Board is our editor’s choice. 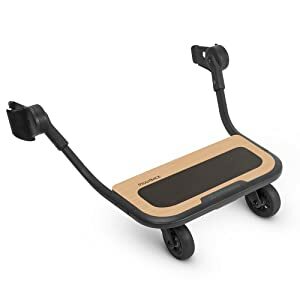 This is the stroller board you can buy if you don’t want to spend time thinking about compatibility with your stroller. And provides the best value for money. As a parent, I believe you care about your child’s comfort and you still want to save money keeping that in mind. Stroller boards can have no alternatives in this case. This list compiles some of the best stroller boards 2019 and should help you find the one that suits you best.